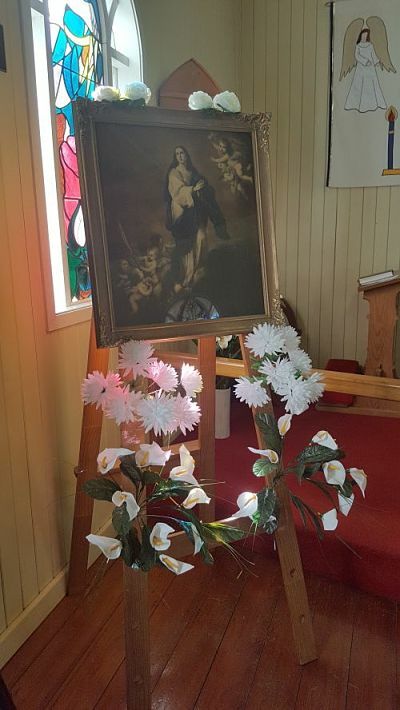 On Sunday 19 August, St Mary’s Anglican Church, Montville celebrated the Patronal Festival of its patron saint, Mary the mother of Jesus Christ. St Mary’s Church, adjacent to the Village Green, has been standing as part of the Montville community for 104 years and is well used for weddings, baptisms, funerals and concerts. The church is open each day and provides a haven for tourists who enter for a moment of quiet reflection in the busy tourist town. Built in 1914, the church was dedicated to the Blessed Virgin Mary on 1 August by the Venerable H. F. Le Fanu who later became the Primate of Australia. Before the completion of the church’s beautiful wooden structure, regular services for the Church of England parishioners were held next door in the Montville School of Arts. As the priest in charge at that time lived in Maroochydore, the majority of early services were conducted by the Warden, George Brown, whose daughter Dawne Barnett is still a communicant at St Mary’s. People from all over the world come to visit Montville and drop into St Mary’s to leave messages of love and appreciation in the Visitors Book, often with a prayer request which is then offered up at the 7.30am Sunday service of Holy Communion. On Sunday 19 August, the church was decorated by the parishioners with blue and white flowers, colours that are attributed to the Blessed Virgin Mary, and a painting depicting Mary’s special position within the Christian Church.